I spent Saturday cleaning. The day before had been surfaces - cupboards and bathrooms and showers and toilets and whatever else appeared not quite perfectly clean. Saturday was floors, sweeping and mopping and scrubbing and washing mats until finally the house felt Ready. Our fifth precious one was due on Sunday, but our last three had all been 5-8 days overdue so I wasn't holding my breath quite yet. I was predicting her arrival for the following Sunday, Father's Day. I did want the house to be Ready, though, just in case. At 6:00 am on Sunday, I woke to crampy contractions, as I had each morning at 6 am for the past few days. They were irregular and minor and I paid no attention to them. At 9:00 am, I went to the bathroom and discovered the slightest bit of bloody show. I crawled back into bed and told my half-asleep husband that the baby was coming today. The contractions continued to be crampy, irregular, and minor. I had a shower around 9:20, during which the contractions become strong and regular but short. They stayed that way while I put clean sheets on the bed and folded a load of towels. At my husband's prompting, I paged the midwife at 9:50 and again at 10:00. She called back to say that she was at another birth but would send another midwife from the clinic. We had discussed previously how much I did not like having a stranger in my home as the second midwife during Min's birth, so my initial reaction was are you KIDDING me?? But then she told me who it was; it was a midwife who had been part of my team for Kai's insane unplanned unassisted birth, so that was okay then. I was already quite fond of her and would be happy to have her be here. After hanging up, we started timing my contractions at 10:15. They were consistently about 45 seconds long and 2-3 minutes apart. I was leaning on the dresser or on my husband and rocking through each one. They were strong but felt productive and easily manageable. We called the midwife again at 10:56 because she still wasn't here and things were feeling pretty serious. She said she was a few minutes out and to call her if the water broke. Less than 5 minutes later, my water did indeed break and we called back to let her know. It was now 11:00. With my water broken, I knew the baby would likely be coming within the next couple of contractions. I moved to the shower, laid down a couple of towels, and got onto my hands and knees. The next ctx hit and it was strong. I lost my focus and allowed a bit of panic to set in and fight against the ctx, and while the baby did move lower, there was no crowning yet. After it eased, I managed to get one of my legs up so that I was in a better position. I calmed myself down, re-focused, and when the next ctx began, I worked with it and the baby was delivered entirely - head, followed by the slightest of pauses, and then the rest in one smooth motion, there into my waiting hands. It was 11:07 am, just over two hours from the time I had told my husband the baby would be arriving sometime that day. At this point the midwife was on the stairs. So close, but once again we had unexpectedly had an unassisted birth. The baby began crying immediately. After resting there holding the baby for a couple of minutes, I looked at my husband and asked, "shall we check?" We unwrapped the towel and discovered, to my surprise, it was a girl! We had a name for her before she was even conceived. Each of our kids had hoped we would have a girl. I would have been delighted either way, but I was grateful that our other daughter would have a sister. I needed to shift positions, so I asked that we cut the cord now. Kai stepped forward and helped the midwife do so, and I handed our little girl to my husband. I moved into a more comfortable position and the placenta came without difficulty a few minutes later. I showered and moved into our bed. The midwife checked us over and both baby and I were fine. The morning had been perfect. Everything had gone absolutely beautifully. There were no paramedics and fire fighters as with Kai's birth, no feeling of being swept along by the contractions as with Ell's birth, and none of the difficult decisions that came along with Min's birth. We had deliberately chosen this time to only have my husband, our kids, and the midwife there for the labour and delivery. We may have missed out on the midwife by a minute, but it was perfect anyway. For our previous three homebirths, we had always included a dedicated support person for the kids. This time, however, we felt comfortable forgoing that (although I did have a wonderful friend on-call in case things did not proceed smoothly and an adult was needed for the kids). I am grateful that we made this choice. There was no pressure, no deadline. In the days prior, there had been no nervousness over whether the baby would arrive before whatever family member was coming to take care of the kids. No one was staring at their watch waiting for me to go into labour before they had to catch a plane back home. There were no extra voices or eyes in the house while I focused on birthing our child. It was simply perfect. We had, as always, prepared the kids for the homebirth in advance. The kids had been in and out of the room during labour and knew that they were welcome to be there for the birth if they wanted to. Jay had been leading the midwife up the stairs and came into the bathroom just as she was born. Kai had been offered the opportunity to be there after my water broke, but had replied that he was listening to an audio book (C.S. Lewis's "A Horse and His Boy") and to please come get him after the baby arrived (all the laughter and tears at how perfectly "Kai" that reaction is). Ell and Min were both there, along with my husband, who had been, as always, a wonderfully supportive partner throughout the labour and delivery. Our newest child (nicknamed Zoe in this space) is now five days old. Our first few days have been spent snuggling close as we rest, leaving everything else alone for a while. The world will wait; we will emerge when we are ready. The lovely husband is caring for each of us wonderfully. Zoe and I are working on getting a good (pain-free!) latch - after four other babies, I wasn't expecting this particular challenge, but here we are and we're figuring it out. I am so grateful for the blessings of these past few days - her beautiful birth, her beautiful self, and each beautiful member of our family. As year-round homeschoolers, there is no defined beginning or end to our homeschooling year. We flow from season to season as we strive for a holistic life-learning approach to education. Each season, however, brings with it a rhythm of its own, a fresh way to look at our learning and to structure our days. Here we are on the cusp of summer. With a fifth little one expected within the next week or two, our summer will certainly require a shifting of rhythms. Most years, however, our summers are spent in outdoor exploration with little in the way of structure. We try out new beaches, parks, and playgrounds. We talk, ask questions, find answers. We learn the names of the flowers currently blooming and we tend our vegetable garden. Butterflies are raised and released. New recipes are tried. Our days are often flipped around to take advantage of the cooler morning weather. This works well for a season, and as autumn approaches we find ourselves ready for a bit more routine to our day. Although we tend towards an unschooling approach, some sort of framework keeps that unschooling from sliding into chaos for us. As the rain begins, we move into a different yet familiar rhythm. The specifics differ with each year, taking into account family circumstances and each child's individual needs, but the framework of it is generally the same. After this gathering, we move into individual RRR time. Each child spends some time sitting with me on the couch and doing some combination of reading, writing, and/or math, depending on their needs and goals for the year. Reading includes reading practice for those who need it. Our preferred resources are Teach Your Child to Read in 100 Easy Lessons followed by Sets 1-5 of Bob Books. Writing may include letter formation, copywork, dictation, spelling lists, creative writing, or expository writing. Life of Fred is our preferred math resource, along with times tables practice, logic and numeracy games, and other varied forms of numeracy development. Autumn lunches make for an ideal read-aloud time. We particularly enjoy using this time for broad overviews of history such as Hillyer's A Child's History of the World or Gombrich's A Little History of the World. Fall Fridays are STEAM project day, where we set aside our usual Gathering and RRR times and focus on hands-on science and art instead. A portion of each afternoon is reserved for quiet time, an essential part of our day for each of us. As fall moves into winter and a new calendar year begins, we often find the need to freshen up our usual routines. While autumn tends to have an individual focus with a heavy emphasis on reading, writing, and math, winter seems to demand a more cozy, group-based rhythm. Our Morning Gathering continues, but the spiritual portion is truncated. We read Scripture, pray together, and sing a hymn. We choose a hymn for about a week and go through it one verse per day, discussing what the words mean. This becomes a great theology and vocabulary lesson! The kids take turns reciting our monthly poem; we've been going through Maurice Sendak's Chicken Soup with Rice book this past year. The poems are simple so it's been a great opportunity to focus less on memorization and more on how to make an entrance, introduce a poem, speak clearly, include expression, hold still, and be a good audience. We then move on to a group lesson and discussion on science and history. This past winter we used David Macaulay's How Things Work for science and Gombrich's A Little History of the World for history. - Jay would take The Jesus Storybook Bible and a regular Bible, read the relevant passages from the day's story in the Bible, and then compare/contrast the storybook version against the full version. - Kai would read to me. He's a reluctant reader, so having him just sit and read to me each day greatly helped improve his fluency. - Ell would work on letter recognition and printing with me, as well as early numeracy skills. After that, if we started early enough, we had time for board games before lunch. With Life of Fred on pause for the time being, we chose to do some "gameschooling" for a while before jumping into the next LOF books. This group routine is a good change each year, and the discussions add more science, history, and theology to our day than we typically have in the fall. Eventually, however, our cozy winter group rhythm needs its usual seasonal sprucing up. We wind up our science and history and move once again into a more individual-based rhythm. It's a good time to reevaluate where each of the kids are and what each of them needs for the next couple of months. This spring, Ell insisted that I begin teaching her how to read, and both boys were eager to get back into Life of Fred. We also prepared and planted our garden, spent more time in nature, and of course had the usual pre-baby biology unit (always a favourite with the kids). This led to an unexpected enthusiastic interest in genetics and the opportunity for several other rabbit trails - perfect for spring. As the weather warms up even more, our routine will shift once again into more of an outdoor/nature/exploration focus. This year we'll stay a bit closer to home, allowing me time to recover from childbirth and giving all of us the opportunity to get to know our new little one. We'll do less day trips and make good use of our backyard instead. There will be less audiobooks in the van and more read-alouds on the picnic blanket in the shade. It will be, as always, what our family needs. This seasonal shift in routines works well for us and keeps things feeling fresh and relevant. I believe it to be one of the most important aspects of our homeschooling journey. What seasonal shifts are currently happening in your daily rhythm? As parents, we try to look for ways to say "yes" to our child's requests, allowing them to explore their world and develop their independence. Often, however, our answer must be either "no" or "not yet". When declining or postponing a young child's request, whether because we are unavailable at the moment or because the request itself is unacceptable in some manner, there are a variety of ways to get the message across without a direct "no". These variations acknowledge the child's requests, validate their desires and emotions, and give them a clear picture of what options are open to them. Because the focus is on acknowledgement and positive phrasing, the child is likely to be more receptive to the response and less likely to experience overwhelming emotions and melt down as they otherwise might in the face of a simple "no". "When your pajamas are on, then we can read a story." "Yes, we can go to the park after your toys are back in their basket." I can help you with that after ___. "I will get you a glass of milk after I finish washing these pots." Right now I am ___. Would you like to join/help me? "Right now I am doing the laundry. Would you like to put this shirt into the washing machine for me?" That would be fun, wouldn't it? Let's try ___ instead. "It would be fun to paint the dog. She would be so colourful! I don't think she'd like it very much though. Let's collect some rocks and paint them instead." I wish we could ___, and then _[expand on fantasy]_! How about we _[more acceptable activity]_? "You want ice cream right now? I wish we could too! I'd put cherries and chocolate sauce on mine. What colour of sprinkles would you put on yours? Wow, that sounds delicious. Talking about food is making me feel so hungry. Dinner is nearly ready, so let's set the table together." "You may not play with Mommy's book. Here is one of yours." "It is time for Quiet Time. Which CD would you like to listen to?" "I see that you are spitting. You may go spit in the sink. When you are done, would you like to read a book with me?" Of course, this is only one tool for use in one particular scenario. Taking "no" out of the equation helps to side-step a power-struggle with a small child, but it holds no guarantees; meltdowns and tantrums happen during this time of development when young children are learning how to express and work through their emotions. When the situation warrants it, reflect the child's feelings back to him and, if needed, offer help in expressing those feelings in a healthy, appropriate, and acceptable manner. Each year, in lieu of resolutions, I choose a single word on which to focus for the next 12 months. The fluidity and holistic nature of this word fits my spirit better than one specific resolution. They flow one year to the next, Grace leading to Joy leading to Presence, Intention leading to Rhythm leading to Habit, the culmination of all of those Opening my life wide for what may come. Then, a hard year, a decision to simply Go Forward bravely, one step after another. The year following demanded that I Fearlessly rebuild and heal and live, while the year after that brought Light: Live Light, Seek Light, Be Light. Adapt. Renew. I find these two words circling each other as I look at the year ahead. These past two years have been ones of intense and deliberate habit building. I have shifted my sleep schedule, taken up running, adjusted our homeschooling rhythms, and developed a solid work-from home routine. It's been good. Really good. I'm happy with these rhythms. But change always comes, and I know myself well enough to recognize that the perfectionist in me doesn't adapt well. If I can't keep my ideal routines, then it's easier to simple cast them aside rather than try to fit them into new shapes. Well, change is coming again. In June, we look forward to welcoming our fifth child into our home. I can't tell you how grateful I am to be able to say that. I also can't tell you how very much this changes those intentionally-developed rhythms and routines. I've already had to give up running. I had visions of running throughout my pregnancy, or at least for as long as felt comfortable, but my quickly-loosening joints put an end to that early on. The usual first-trimester exhaustion and nausea meant I was sleeping later and napping frequently. My work hours began to dip and homeschooling rhythms shifted as well. And naturally the prospect of a baby meant that further changes to our family routine would become necessary in the months ahead. Such is the nature of pregnancy: a demand to slow down, to rest, to do less. It didn't take long for that perfectionism and anxiety to start speaking up. If I can't run and if yoga just doesn't quite compare, then I guess I can't really do anything. If I can't get up before the kids are awake, then my usual pre-kids morning routine simply cannot happen at all. And so it goes. Unsurprisingly, that wasn't working either. I could feel it as my anxiety rose, my patience dropped, and my internal motivation went for a run and didn't bother coming back. And so I must Adapt. These rhythms, routines, and habits must be Renewed for the coming year. Rather than write it all off as a lost cause, a bit more creativity and flexibility is required of me. The renewal has begun; we are shifting things around, finding what works, always the continual change but this time keeping a little more of the Good from the hard-won habits of the past two years. Adapt. Renew. The latter brings a sense of birth, fitting for the year ahead, while the former has a less delicate feeling to it, a demand to simply do what must be done. They feel equally fitting, somehow, and I take from each what I need for this time and for the time to come. Do you have a One Word this year? a resolution? a new goal or habit? We'd love to hear about it! Advent begins this Sunday. Often I would still be scrambling to make the necessary preparations at this point, but several years of trial-and-error have smoothed the process for our family. Some years we stay home throughout Advent, while other years have us finishing off the Advent season while travelling to visit family for Christmas. This is a travel year, with the particular joy of getting to spend time with two new nephews born in the past few months. 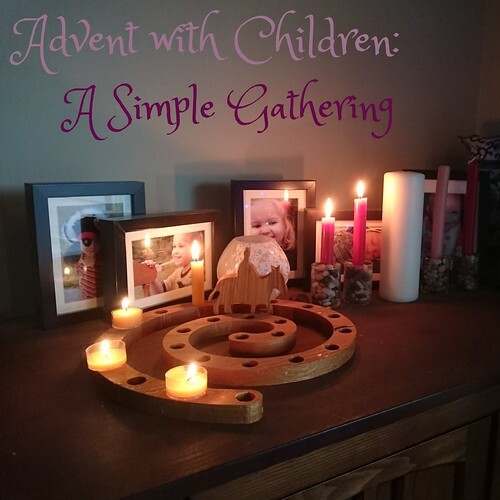 Whether we travel or stay home, we have always worked to observe Advent in some sort of meaningful way with our children. While always shaped by the particular needs of the family, we have found a steady rhythm in a simple daily gathering. We begin by lighting a candle together, which lends a sense of wonder and solemnity to this time of gathering. A traditional Advent wreath is first lit on the first Sunday of Advent, with an additional candle lit each week. A spiral wreath such as this cradle-to-cross wreath or wooden spiral candle holder will count down the days from December 1 until Christmas. Any stand-alone candle can be used instead of a more traditional wreath; more important than the colour or the number of candles is the ritual of marking the beginning of this time of gathering in a distinct way. Next we settle ourselves on the couch and read a portion of Scripture. This can be combined with the Jesse Tree portion (below) or can be an additional reading of some sort. The names of Jesus and their corresponding passages has been a favourite resource of ours for the past few years. The Daily Office Lectionary or the Revised Common Lectionary can provide a helpful guide for daily readings. This Advent reading plan accompanies The Jesus Storybook Bible, a particularly good resource for young children. A Jesse Tree, comprised of 25 stories and their corresponding symbols, tells the story of Christ from Creation to the Messiah's birth. Traditionally a small tree is used on which a new ornament is added after each reading; however, the physical tree, while a nice concrete addition, is not integral to the progression of the story. Unwrapping the Greatest Gift by Ann Voskamp is a popular option, with free colouring pages and tree ornaments to go along with each story. The Jesse Tree by Geraldine McCaughrean is a stand-alone story, which is particularly useful during years of travel. Corresponding ornaments can be created in a variety of ways, however, for those who appreciate the inclusion of a tree. There are countless homemade options and other published Jesse Tree resources that allow you to tailor this time to your family's particular ages and preferences; browse Google or Pinterest until you find your favourite! We close with a short Advent prayer before exchange the Peace and blowing out the candle. The Anglican Family Prayer Book by Anne Kitch is an excellent resource based on the Book of Common Prayer. I appreciate how much it simplifies the process of responsive prayer for our family. Your own preferred Advent resource is likely to include a prayer for the day. A simple free-form prayer can be offered in response to the days' readings. When going the free-form route, I often have each child share something for which they are thankful as a simple low-pressure addition to our collective prayer. The details of our time of gathering changes with each year, but this outline provides a simple framework on which to hang those particular details. The basic pattern of coming together with a sort of ritual, moving into the reading of Scripture and/or devotional, and closing with a hymn and prayer provides unlimited potential for shifting and shaping this time in a way that feels smooth and right for your family. Watch for the Light: Readings for Advent and Christmas, with daily writings from C. S. Lewis, Kathleen Norris, T. S. Eliot, Dorothy Day, Henri Nouwen, Madeleine L'Engle, and more. I hope you find some encouragement above as you create Advent rhythms and traditions with your children. December is a busy month, and a simple time of gathering can prevent us from moving too quickly into Christmastide while also allowing us to prepare our hearts in anticipation of Christ. How does your family observe the Advent season? Please share your favourite traditions or resources as inspiration for the rest of us! I have been thoroughly enjoying N.T. Wright's After You Believe: Why Christian Character Matters. As expected, it's slow going as Wright's words take time to settle in before moving on to the next bit, but it's progressing nicely nonetheless. Highly recommend. I recently finished Erin Hunter's Into the Wild, at Jay's request. He's been enjoying the series and thought I might like it as well. It wasn't quite as bad as I expected (I admit, I was a teeny bit hooked by the end). It did give him the opportunity him to tell me about the rest of the books he'd read so far, and I could ask relevant questions to find out what had happened to various characters. He reads so much (to his little brother's frequent frustration) that I couldn't possibly read everything he does, but it was nice to share this one with him. Otherwise, I've been on a bit of a dry streak as far as reading goes. DH just finished with Gaiman's Anansi Boys, so I'll be picking that one up next; DH chuckled his way through the whole book and then fervently recommended it to me as soon as he was done. Audiobooks. All of the audiobooks. I used to browse our library's audiobook selection before long road trips. The selection was always rather dismal, but I'd usually find a few to put on when the drive started to feel like it needed a good distraction. Somewhere around the best part of the book, invariably, the CD would be too scratched to continue and the rest of the disk would refuse to play. It was rarely a positive experience. And then I discovered online audiobooks through our library. I can browse an incomparably larger selection of audiobooks, borrow them for free, download them directly to my phone, and play them through our vehicle's speakers. It's been amazing. Forget saving them for long road trips - as soon as we get in the car, the kids as for our current selection to be put on. Our car rides are silent now. Silent. And so many good books! We began with Ian Fleming's Chitty Chitty Bang Bang, read by David Tennant. That was a lovely gem of a book, so we quickly listened to the next three in the series, written by Frank Cottrell Boyce and read by David Tennant. They lacked something of the charm of Ian Fleming's original, but they were highly entertaining nonetheless. After that, I chose at random Jessica Lawson's Nooks & Crannies. THIS. BOOK. IS. BRILLIANT. Oh my word. It is everyone's current favourite book ever, mine included. It's basically a children's murder mystery and it is...I'm repeating myself, but it is brilliant. So enjoyable to listen to. Clever and witty and gripping and just brilliant. Susan Riddell did a delightful job of reading it, which just made the whole experience that much better. Love. I have a frightening amount of audiobooks marked as favourite for future listening, as well as an actual CD audiobook of How to Train your Dragon, also read by David Tennant. This is a good problem to have, really. We have Neil Gaiman's The Graveyard Book (one of his children's novels) all set and ready to go for this afternoon's drive. Nothing spectacular has been going on in the kitchen lately, other than a spectacular fail of an attempt to use our dusty breadmaker. Right. That's why it's been sitting ignored in the back of a cupboard for the past couple of years. Because I can't make bread in the breadmaker worth anything. So the next day I bought two proper loaf pans and I'll just make my own bread, because somehow I find that much easier than this blasted breadmaker. The oldest two are currently in a weekly outdoor adventure camp for homelearners, which has been great. Today is archery and next week is canoeing, so to say they're excited would be putting it mildly. They're also taking skating lessons right now. Kai has often been in skating lessons, but Jay was never interested. I signed him up for this current session because he had expressed interest in learning how to skate, but then when the time came, he decided he didn't want to go after all. I sent him out on the ice anyway, and afterwards he told me that he hated to have to admit it, but he kind of enjoyed it. Kind of enjoyed it is high praise from that one. On the way to that first skating lesson (after two days of being grumpy with me), he told me that there was a two percent chance he might like it, but only because there weren't any other kids in his class so no one would laugh at him for not knowing how to skate. I told him people wouldn't tease him anyway, just like he didn't tease his friends for not knowing things that he knew. "Thanks," he told me, "now there's only a one percent chance I'll like it, since people wouldn't tease me anyway." I took away his silver lining, apparently. Lessons and camps aside, we've been enjoying plenty of trips to the park, a couple of visits from extended family, some kite flying, one morning of turning the entire living room into a giant fort, and another morning of using shaving cream to make marbled paper. Good times. We have a family road trip coming up at the end of June - and yes, I'm already planning what audiobooks to borrow for the trip. Other than that, June will be a quiet-ish month of finishing up our current round of activities and settling back into our usual routine. Well I know I can't enter you in THAT contest! He said it with that familiar teasing nine-year-old smirk of his. I looked at the poster he had motioned towards. "Enter now: Tell us why YOUR mother is the best in the world!" That stings a little, but I know what my literal boy was getting at. It's true, I am most definitely not, nor ever will be, the best mother in the world. I gave him a mock glare, he flashed me a cheeky grin, and we continued on with our day. But it still stung. It was true and it was meant in a teasing manner and it still stung. There was something else there as well, though, something deeper than the twist of a kid reminding you of your imperfection. There was relief, because he said that. To me. Directly and honestly and without fear. Goodness knows I could not have been so honest as a child, could not have acknowledged such a reality. I climbed up onto the bunk bed later that night, our evening snuggle as important as ever. You know, I told him, what you said earlier about me not being the best mother in the world was true...but it still hurt my feelings a bit. But you're not the best mother in the WHOLE WORLD, he reminded me. I know. I'm definitely not, and it was okay for you to say it. But it still hurt a bit. I don't know who would be the best mother in the whole world. I don't know either. What do you think she would be like? Hmm. Maybe someone that let you do whatever you wanted. Except then she wouldn't be a very good mother because she wouldn't do the things like you do, like teaching me and stuff. I'd just be spoiled and it wouldn't really be being a good mother even though it's what I would want. Interesting. I understand what you mean. What do you think you would do if I said you could do whatever you want? I don't know, he giggled. I'd probably spend the whole day just sitting there trying to figure out what I wanted to do! Probably ask for a million dollars and my own phone that I could play games on whenever I wanted to. And so the conversations go. It's true, and the reminder is uncomfortable and painful: I'm not the best mother in the world. I am too often impatient and demanding, criticizing instead of encouraging. I lose my temper and shout when I should draw near with quiet connection. I use my authority to badger into submission rather than guide towards maturity. I huff and sigh and stomp. In my selfishness, I forget to really see them. I'm not the best mother in the world, but I am the mother of a child who knows that, who knows that I want to be a good mother but I mess up, I make mistakes, I'm not even remotely approaching perfect. I try, I fail, and I apologize, providing them with the knowledge and assurance that they are worthy, that they don't deserve to be treated poorly, and that my mistakes are not excused simply because I'm an adult. And they will not grow up to say, "It was good enough for me, so it's good enough for my kids!" They will not say, "Well, my parents did it and I turned out fine." No, they will know that I did my best but wanted to do better. They will know that they can learn from my mistakes, grow, and do better for their own children. Upholding the status quo is not enough. I want my kids to do better. I don't want "good enough" when it comes to them. I want better than "fine". I want them to thrive, blossom, and grow. As I strive to do better than my parents, I pray my children will do even better than I - and their children after them, and on and on through the generations. Not stagnating, but improving; there is always room for improvement. This is how we grow: we don't settle, we learn. So to the rest of the imperfect mothers out there: It's okay. They'll learn from our mistakes as much as from the things we get right. And we'll all grow.